Detroit (Fr. detroit, the narrows), a port of entry and the chief city of Michigan, capital of Wayne co., situated on the N. W. side of Detroit river, about 7 m. from Lake St. Clair, and 18 m. from Lake Erie, 80 m. E. S. E. of Lansing, 225 m. W. by S. of Buffalo, and 250 m. E. by N. of Chicago; lat. 42° 20' N.. Lon. 82° 58' W. The city extends along the bank of, the river about 7 m., and is built up for about 2 1/2 m. from the water. For at least 6 m. the river front is lined with mills, dry docks, ship yards, founderies, grain elevators, railway depots, and warehouses. The ground on which the principal part of the city is built rises gradually from the river to the height of from 20 to 30 ft., at a distance of 15 to 30 rods from the shore; it then sinks slightly, and again rises gradually to the height of 40 to 50 ft. above the river. The river here is about \ m. wide, and has an average depth of about 32 ft., and a velocity of about 2 m. an hour. It gives to the city the best harbor on the great lakes. Fort Wayne, about a mile below, commands the channel. Belle Isle, at the head of the river, is a favorite resort for picnics. Grosse Pointe, projecting into Lake St. Clair a few miles above the city, is noted for its cherry orchards, and is the terminus of a beautiful drive. Grosse Isle, near Lake Erie, contains many fine residences. Put-in-Bay island, in the lake, near the mouth of the river, famous as the scene of Perry's victory, Sept. 10, 1813, has become a summer resort. The population of Detroit has been as follows: in 1810, 770; 1820, 1,442; 1830, 2,222; 1840, 9,102; 1850, 21,019; 1860, 45,619; 1870, 79,577, of whom 35,381 were foreign born and 2,235 colored. Of the foreigners, 12,647 were natives of Germany, 7,724 of British America, 6,970 of Ireland, 3,284 of England, 1,637 of Scotland, and 670 of France. There were 4,969 persons, 10 years old and over, who could not write, of whom 4,117 were foreigners. There were 15,636 families and 14,688 dwellings. - Detroit is laid out upon two plans: the one, that of a circle with avenues radiating from the Grand Circus as a centre; the other, that of streets crossing each other at right angles; the result of which is a slight intricacy in certain quarters, and a number of small triangular parks. The avenues are generally 100, 120, or 200 ft. wide. The streets vary in width from 50 to 100 ft., and are for the most part abundantly shaded with trees. The principal streets are Jefferson avenue, parallel with the river; Woodward avenue, which crosses the former at right angles, and divides the city into two nearly equal parts; and Fort street, Michigan avenue, Grand River avenue, and Gratiot street, at various angles with Woodward avenue. West Fort street and Lafayette avenue are handsome streets. The Grand Circus, the principal park, is semicircular, and is divided by Woodward avenue into two quadrants, each containing a fountain. The Campus Martius, about 1/8 m. from the Grand Circus, is an open space 600 ft. long and 250 ft. wide, which is crossed by Woodward and Michigan avenues, and from which radiate Monroe avenue and Fort street. Facing the Campus Martius on the west is the new city hall, a handsome structure 200 ft. long, 90 ft. wide, 66 ft. high to the cornice, and 180 ft. to the top of the tower, completed in 1871 at a cost of $600,000. It is built of sandstone, in the Italian style, and consists of three stories above the basement, with a Mansard roof. In the square fronting the city. hall stands a monument in memory of the Michigan soldiers who fell in the civil war. Facing the Campus Martius on the north is the opera house, one of the largest and finest edifices of the kind in the country. The custom house, which also contains the post office, is a large stone building in Griswold street. The board of trade has a handsome building near the river. The Roman Catholic cathedral is the largest church edifice in the city. St. Paul's church (Episcopal) is noted for its self-sustaining roof, and the central Methodist and Fort street Presbyterian churches are fine specimens of architecture. The convent of the ladies of the Sacred Heart, in Jefferson avenue, is a large and beautiful building. One of the most noteworthy structures is the Michigan Central freight depot, 1,250 ft. long and 102 ft. wide, consisting of a single room, covered by a self-sustaining roof of corrugated iron. Near it is the great wheat elevator of the company, the cupola of which commands a fine view. The principal cemeteries are Woodmere, on high ground 4 m. W. of the city; Elmwood, 2 m. E. of the centre of the city; and Mt. Elliot (Catholic), adjoining Elmwood; besides which there are a Lutheran and four Jewish cemeteries. Eight lines of railroad radiate from Detroit, viz. : the Michigan Central, extending to Chicago; the Lake Shore and Michigan Southern, to Buffalo and Chicago; the Detroit and Milwaukee, to Grand Haven; the Great Western of Canada, to Niagara Falls; the Grand Trunk to Portland, Me. ; the Detroit, Lansing, and Lake Michigan, to Howard City; the Detroit and Bay City, between those places; and the Canada Southern. Eight lines of street railroad, with more than 40 m. of track, intersect the city, and three lines of ferry boats ply across the river to Windsor on the Canadian side. There are seven steamboat lines, with 70 boats running to various points on the lakes. - The foreign commerce of Detroit, as shown by the report of the bureau of statistics, is exclusively with Canada, though a few vessels have loaded direct for Liverpool. For the year ending June 30, 1873, the imports amounted to $1,900,228, the exports to $2,818,408. There were entered and cleared 1,949 American vessels of 307,760 tons, and 1,522 foreign vessels of 489,596. tons. In the coastwise trade the entries were 1,184 steam vessels of 581,243 tons, and 2,022 sailing vessels of 203,666 tons; clearances, 1,174 steam vessels of 568,131 tons, and 2,056 sailing vessels of 204,995 tons. The amount of flour and grain in store Jan. 1, 1874, was: 4,850 bbls. of flour, 106,618 bushels of wheat, 39,718 of corn, 29,046 of oats, and 16,520 of barley. The receipts of apples in 1871 were 328,763 bbls. ; in 1872, 91,334; in 1873, 84,880. The receipts of lumber in 1871 were 103,000,000 ft., of which 65,200,000 came by rail, 33,500,000 by lake, and 4,300,000 from Canada; in 1872 the receipts were 76,-947,000 ft., of which 4,900,000 came from Canada. About 60,000 cattle were sold in the Detroit market during the year, valued at $2,422,000; hogs sold, 160,000, value $1,760,-000; sheep sold, 120,000, value $435,000; total value of live stock sold, $4,617,000. The city contained 642 stores in 1871, and there were 27 incorporated companies, chiefly manufacturing, having an aggregate capital of $3,391,500. The manufactures are important, and have been rapidly extended within a few years. The vicinity to the Lake Superior iron region has given especial prominence to the working of iron, which employs 31 establishments, having an aggregate capital of $4,000,-000, and an annual product of $10,000,000. 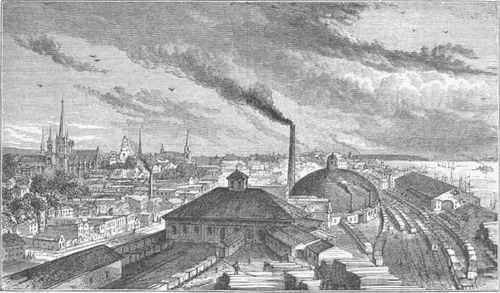 These include 3 blast furnaces, 2 steam forges, a par wheel foundery, a manufactory of iron bridges, 11 machine shops, 5 boiler shops, 2 stove founderies, a manufactory of plumbers' and gas fittings, and a safe factory; to which may be added the railroad repair shops, the two blast furnaces and extensive rolling mills at Wyandotte, belonging to Detroit capitalists, and unenumerated establishments in the city. Besides the very extensive Pullman car works, there are two railroad car factories, producing $4,500,000 worth of cars annually; 12 saw mills, which in 1873 manufactured 44,138,000 ft. of lumber; 3 ship yards; numerous manufactories of woodwork, including several of chairs and furniture, 1 of organs, 2 of wooden ware, 1 of matches, several of boxes, of sash, doors, and blinds, etc, producing annually goods valued at about $4,000,000. In and near the city are 22 brick yards, manufacturing about 54,000,000 bricks annually. There are 7 large flour mills, which in 1873 produced 212,000 bbls. of flour; about.60 breweries, malt houses, and distilleries, yielding 90,000 bbls. of beer annually; 16 tobacco factories, having an annual product of about $4,500,000; a large number of cigar factories, 17 tanneries, 4 steam cracker bakeries, 4 large manufactories of boots and shoes, 1 of white lead, 2 of chemicals, 1 of hats, caps, and fur goods, and several of confectionery. The Detroit copper-smelting works annually produce over $2,000,-000 worth of ingot copper from Lake Superior ore. There are 3 national banks, with an aggregate capital of $1,900,000; 3 state banks, capital $350,000; and 4 savings banks, with $390,000 capital, of which all but one do a general banking business also. The aggregate deposits, Oct. 1, 1872, were $9,416,000. The Detroit fire and marine insurance company has a capital of $150,000, the Michigan mutual life insurance company of $100,000, and the Michigan health insurance and relief society of $10,000. - The government is administered by a mayor and a board of aldermen of 22 members (two from each ward) elected by the people for a term of two years. There are a court held by the recorder, a police court, and a superior court of civil jurisdiction; and the circuit and probate courts for Wayne county, and the United States circuit and district courts for the eastern district of Michigan, are held here. Detroit has a police force consisting of about 100 men, under the control of a board of four commissioners appointed by the governor of the state. The fire department, managed by four commissioners, has seven steam fire engines, two hook and ladder companies, and a fire alarm telegraph. The water works, valued at $1,221,752, are under the charge of five commissioners. The water is pumped from the river by three steam engines, having an aggregate capacity of 32,000,000 gallons daily, into the mains and a reservoir 1 1/2 m. back, holding 10,000,000 gallons, and is distributed to every quarter of the city through 160 m. of pipe. The average daily consumption is 9,000,000 gallons. The city is furnished with gas by two companies, and has 1,137 street lamps. There are 40 1/2 m. of paved street and 79 3/4 m. of sewers. Many of the streets are paved with wood. The assessed value of property in 1872 was $23,615,674; cash value, $78,-718,913; taxation for all purposes, $785,248. The house of correction, with capacity for 450 prisoners, is used for the confinement of petty criminals. Directly opposite is a home for discharged female prisoners. The United States marine hospital, on the bank of the river, just above the city, commands a fine view of the Canada shore. The other principal charitable institutions are the Harper hospital, adapted for 500 patients, St. Mary's hospital (Catholic), St. Luke's hospital and church home (Episcopal), the German orphan asylum, the women's hospital and foundlings' home, the Protestant orphan asylum, St. Anthony's boys' orphan asylum (Catholic), St. Vincent de Paul's orphan asylum (Catholic), the free dispensary, the home for the friendless, the retreat for the insane, and the Hebrew widows' and orphans' society. In the ladies' industrial school vagrant children are taught the elements of learning and industry. The public schools are under the control of a board of 22 inspectors (two from each ward), elected by the people for two years, who appoint the superintendent of schools. A school census is taken between Sept. 1 and Oct. 10 of each year. In 1871 there were 28,779 children between the ages of 5 and 20 years, of whom 13,699 did not attend school during the year, and 12,092 between 8 and 14 years of age. The schools are divided into five grades: the high school and senior grades, in each of which the course is three years, and the junior, secondary, and primary grades, in each of which the course is two years. The statistics for the year ending Dec. 31, 1871, are as follows: number of schools, 131, viz. : 1 high, 18 senior, 30 junior, 37 secondary, 43 primary, and 2 mixed; number of teachers, 170, of whom 8 were males; pupils enrolled, 11,866; average daily attendance, 7,749; value of school property, $505,-810. The receipts for the year ending April 1, 1872, were $162,615 from the city appropriation for schools and school houses, $13,054 from the primary school fund, and $2,629 from other sources; total, $178,298. The expenditures for the same period were $192,024, of which $76,413 were for teachers' wages, and $61,703 for building and furnishing school houses. At the close of 1871 there were 22 school buildings, with accommodations for 8,517 pupils, and two nearly completed, which would raise the number of sittings to about 9,500. There are a German-American seminary, a German Lutheran school, and several Catholic schools. The Detroit medical college was organized in 1868, and the Detroit homoeopathic college in 1871. The public library contains more than 20,000 volumes; that of the young men's society, about 12,000; the library of the mechanics' society, 4,000; and the bar library, 3,100. The newspapers and periodicals are: 8 daily (3 German), 3 triweekly, 14 weekly (3 German), 7 monthly, and 2 quarterly. Besides the opera house, there are the German Stadt theatre and 23 public halls. There are 64 churches, including 5 Baptist (1 French, 1 German, and 1 colored), 2 Christian, 2 Congregational, 7 Episcopal, 2 Jewish, 7 Lutheran (German), 10 Methodist (2 German and 2 colored), 1 New Jerusalem, 6 Presbyterian, 9 Roman Catholic (1 French and 2 German), and 1 Unitarian; also 1 Spiritualist and 2 Christadelphian societies. There are 12 mission Sunday schools (1 French and 1 German), having an average attendance of about 1,800, and 3 convents (1 German). - The site of Detroit was visited by the French as early as 1610; the first permanent settlement was made by a party under Antoine de la Motte Cadillac in 1701, when Fort Pontchartrain was built. In 1763 it passed into the hands of the English, and immediately afterward was besieged for 11 months by Pontiac in his attempt to expel the whites from that region. In 1778 it contained about 60 log houses, 300 inhabitants, and one Roman Catholic church. The same year the British erected a fort, at first called Fort Le Noult, but after the war of 1812 known as Fort Shelby, which remained till 1827. By the treaty of peace in 1783 Detroit was ceded to the United States, but the Americans did not take possession of it till 1796. It was destroyed by fire in 1805, one house only escaping. In 1807 the present city was laid out. During the war of 1812 it fell into the hands of the British by the surrender of Gen. Hull, but came again into the possession of the Americans in 1813, after the battle of Lake Erie. It was incorporated as a village in 1815, the government being vested in five trustees, and in 1824 a city charter was granted. Destructive fires occurred in 1836, 1840, 1848, and 1865. Upon the organization of the territory of Michigan in 1805, Detroit became the seat of government, and was the capital of the state from its admission into the Union (1837) till 1847.